Due to an overload of festivities to attend today, I skipped my ritual of only attending a full day on Saturday at the Multicultural festival and went and had a sneak peak/taste test last night. In past years, Friday night is usually only a big concert with Australian headliners and food really only happening on Saturday (Sunday is usually only filled with half the food stall holders). This is why Saturday is usually my primary day but now more food vendors have been opening up early for Friday night business. Multicultural festival rules~ I have a few rules that I adhere to during the festival for convenience and comfortability which you might find handy. Wear an across the body bag (or small one). Canberra might look dead for most of the year but this is the one weekend Civic will be packed to the brim and there will be a lot of snug situations. Plus it is easier to eat and drink with two hands. Pack wetwipes and tissues. If you’re smart, you will share a lot of your different types of bread and finger food from around the world with friends and they will only give you one napkin. Wear comfortable shoes. I saw girls with 6 inch heels last night who tripped over many things. A lot of rubbish and cans end up on the ground, cable covers are running between every stall and even my friend gave up wearing her heels ten minutes in from a blister. Look but don’t touch. 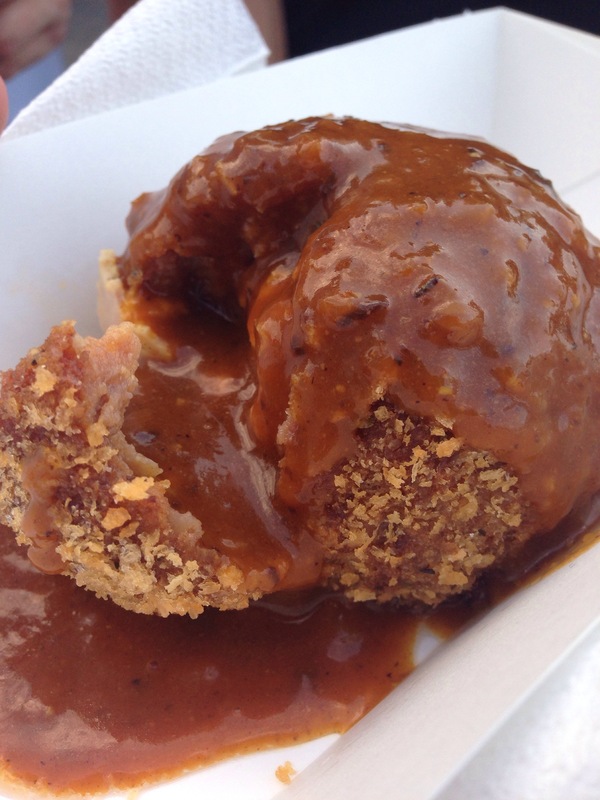 If it is your first time at the festival, you may be tempted to eat the first thing that interests you. I like to scope out the whole place before I will buy any food, I remember what interests me, find my old favourites and see what is new. Your stomach is valuable real estate. I don’t usually commit myself to a whole plate of curry or a whole sausage hot dog because I don’t want to get full from one country, I want to experience as much as possible. Last year Turkish Gozleme stalls were plentiful, the year before that was Thai (so many satay skewers), this year I have noticed more Peruvian food (not that they are even close to being the dominate food) but there is a good mix of different cultures this year. 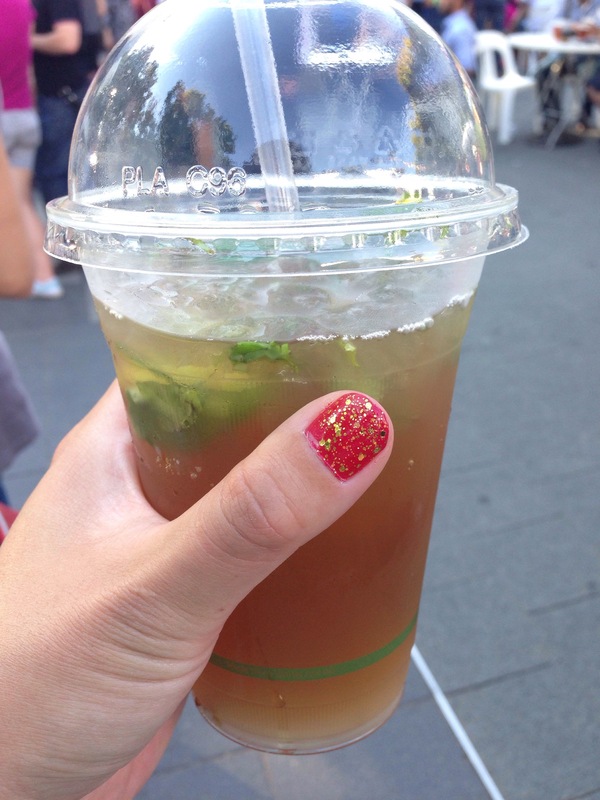 Ginger, lemon and mint iced tea ($5.00). It is hot this year is it was easy to start off with a drink. It isn’t common to find something that is non alcoholic and not a commercial soft drink so when we saw these iced teas at SpanThai we jumped straight on it. Don’t line up in the long line where people are waiting to order food, go straight to where you see girls with the iced tea (usually no line). This stall intrigued me as I looked over there were two massive paella pans, one filled with paella and the other with pad Thai. I guess if you had a craving for both Spanish and Thai food you can now find them in one convenient location. 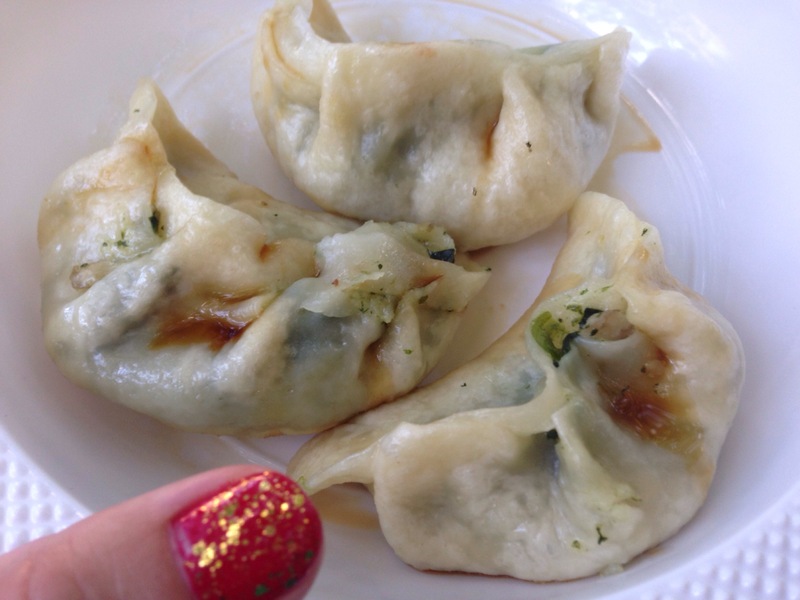 Himalayan momos (6 for $10.00)– there is usually more than one stall selling these and in previous years I have found that some vendors have a ‘too thick of a dumpling wrapper’ to actually enjoy these and I just end up eating the filling. Last night I only saw one Himalayan vendor from the Tibetan society and they had very good momos. We got a mix of veg and meat dumplings but everyone agreed the meat ones were better. 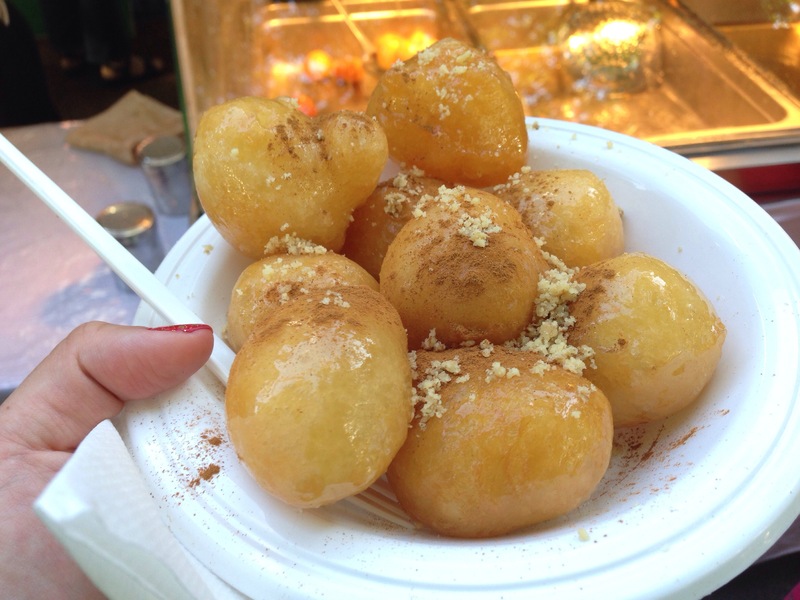 Loukoumathes homemade traditional Greek sweets dipped in honey topped with walnuts and sprinkled with cinnamon ($5.00). These are a festival must until I find a nice Greek family to adopt me. This year they have three package sizes ($5, $10 and $15), small is still big enough to share among a whole group of friends. I don’t know if it was just the small one I ate but it was more hollow and crunchy this year rather than a more honey soaked spongy texture. 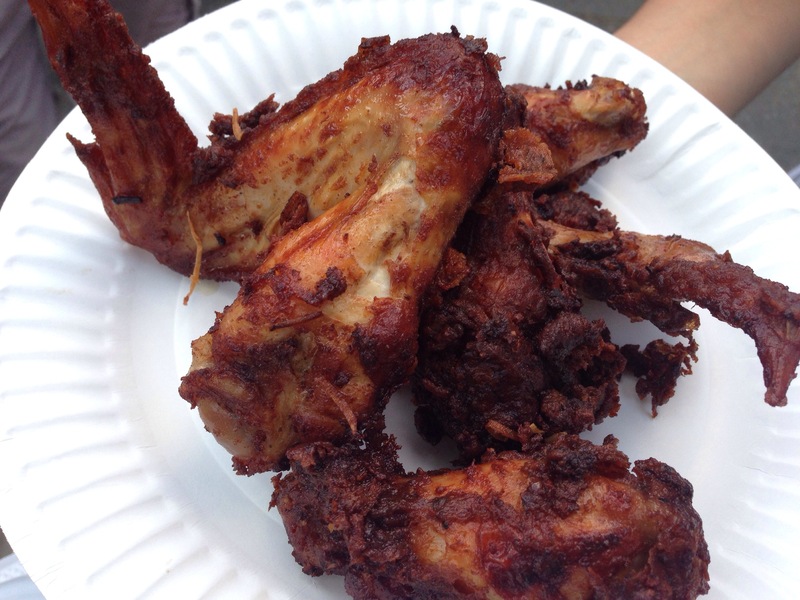 Thai chicken wings (3 for $5.00)– I know they aren’t anything special but I just can’t go past a chicken wing and these ones were served very hot and tasty. This stall also had an interesting looking shredded beef with sticky rice that I might try today. 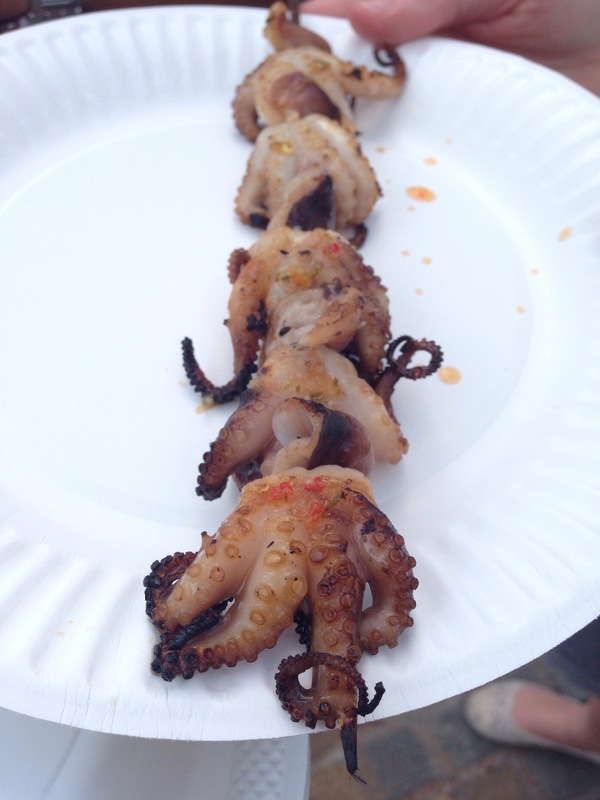 Grilled octopus – the same Thai vendor was selling grilled octopus and it was rather good, it had nice BBQed flavours without being overcooked and chewy. 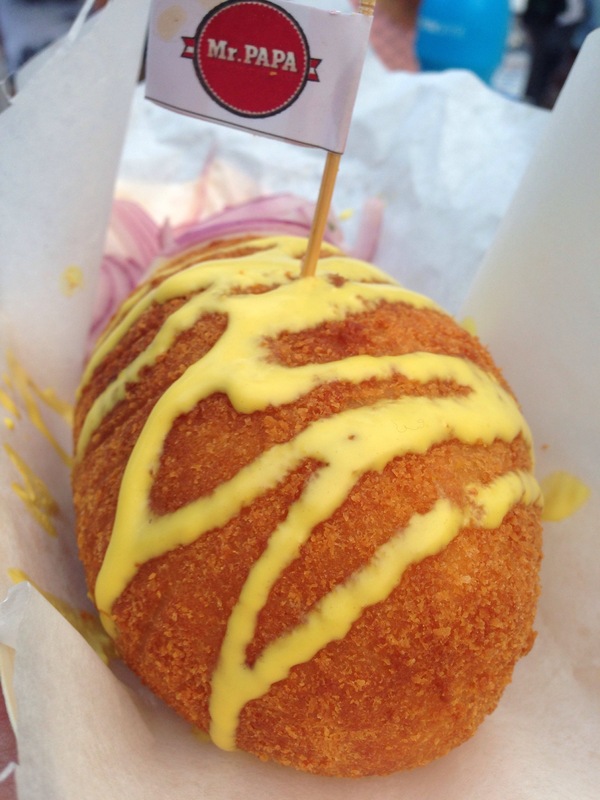 Scotch egg a boiled egg, wrapped in sausage meat and then deep fried ($6.00). I had never seen this stall before and it never dawned on me that we have never had British food in recent years at the festival before either. Not being exactly sure what a scotch egg is, I go and inquire and as weird as it sounded I still bought one for experience sake and I figured if there is 5+ people eating, this thing it will all go. It wasn’t the prettiest looking thing and probably looked worse when we added a curry sauce on top. 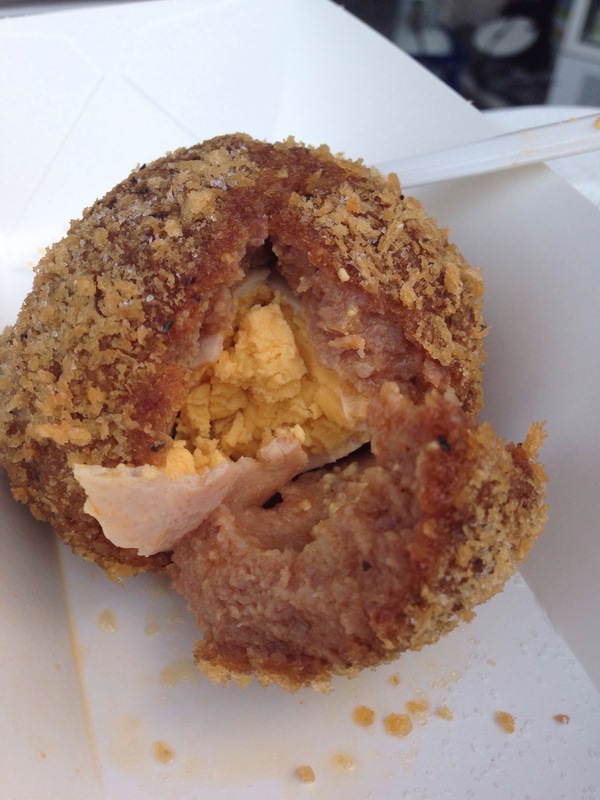 This was a boiled egg, covered in sausage meat and then deep fried, I couldn’t really taste much of the over cooked egg and it was predominately sausage that you could taste. Between all of us it still didn’t get finished but now I can at least dsay I’ve had a scotch egg. 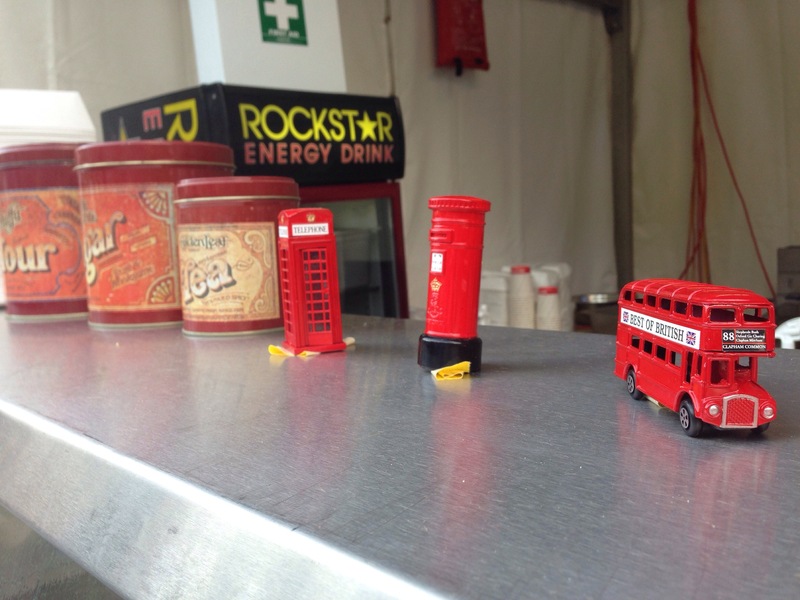 Cute little figurines that are iconically Brittish. A cross section before the sauce. Topped with a nice curry sauce but it didn’t really help with what was underneath. During a greedy moment when we had just bought the scotch egg and everyone was trying some, I noticed a couple happily indulging in some oily looking bread (that stuff is so good) so I had to go ask what it was. 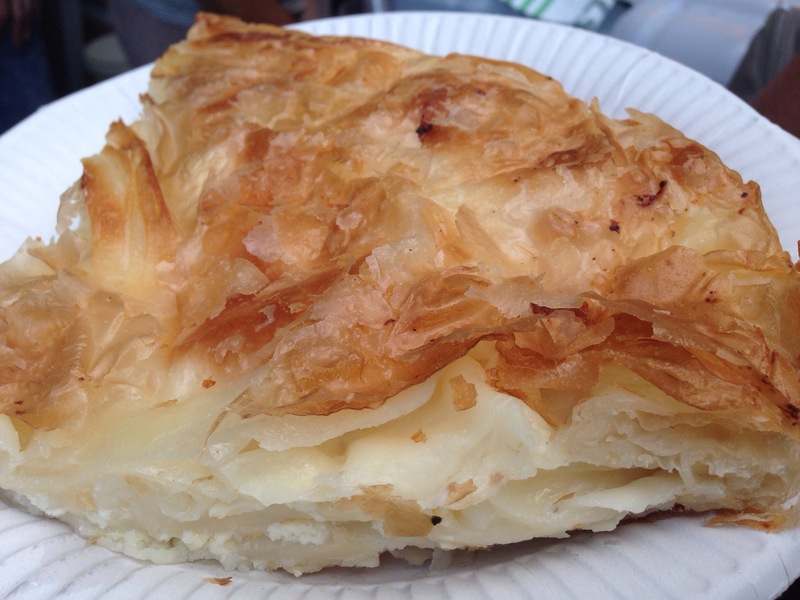 It was from the Serbian White Eagles FC stall and it was a Burek with cheese ($8.00) which tasted like a flaky pastry (close to filo pastry) cooked with a lot of fetta cheese in the layers. Of course I had to get one, at the stall they mention to each other that is the last few, I couldn’t tell if they were making more. It was hard to share at first with the pastry being very hot and it was part flaky part soggy but I’m glad I got one. 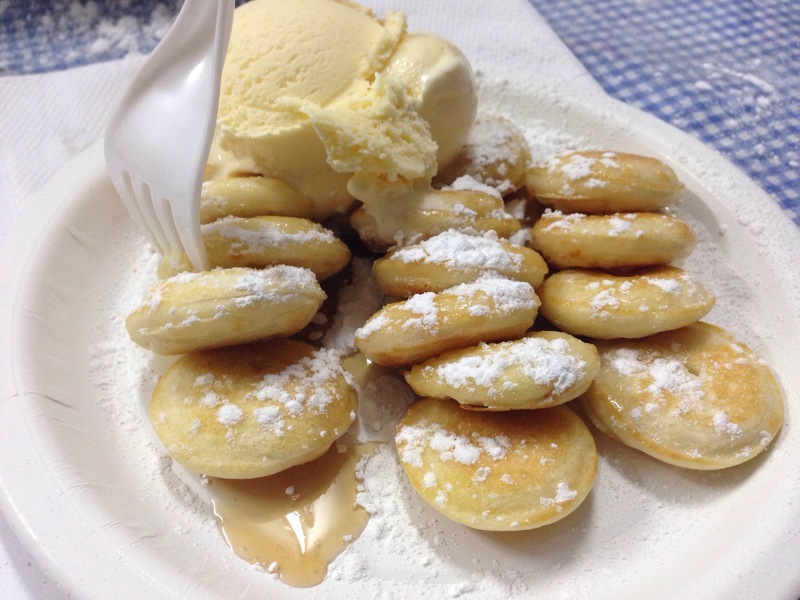 Dutch pancakes ($10.00 a plate). Yes they still have long lines but we didn’t have to wait long. Still very good and maple syrup and ice cream is still the best topping. 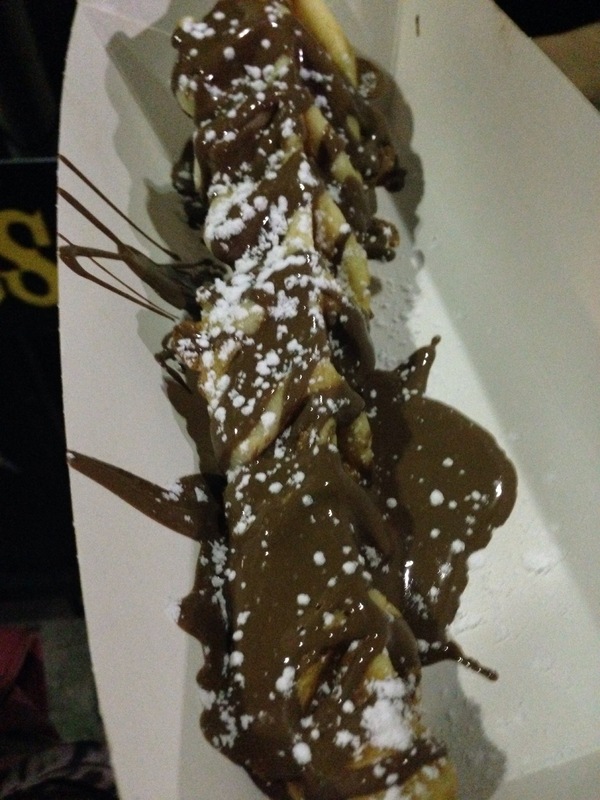 Waffle on a stick ($5.00 with another $2.00 for the melted chocolate). This was pure gimicky but the waffle batter smelt nice enough for me to get one. While waiting for our order, the stall lights went out but not their power so they were making waffles in the dark. It was mediocre, a bit dry and probably not worth the money. 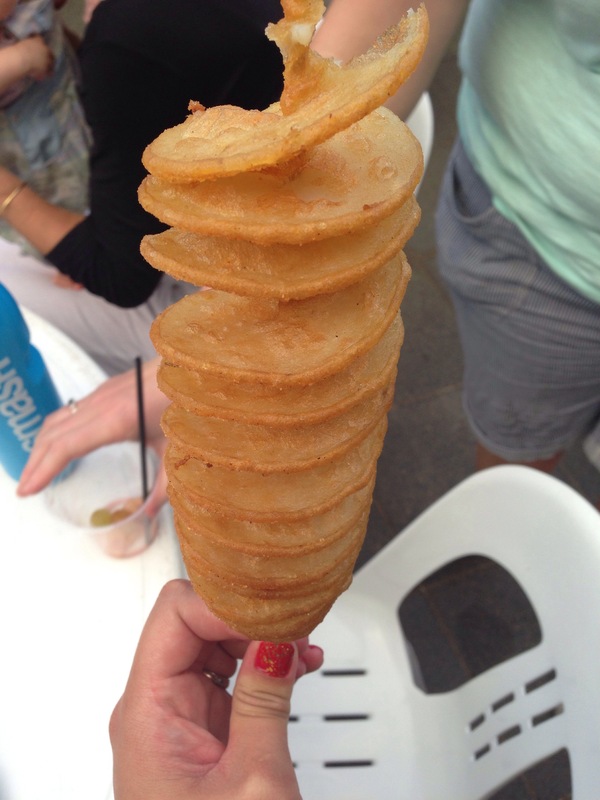 Chip on a stick ($5.00). I guess it was inevitable that someone got one especially since there were two stalls at either end of the festival this year. 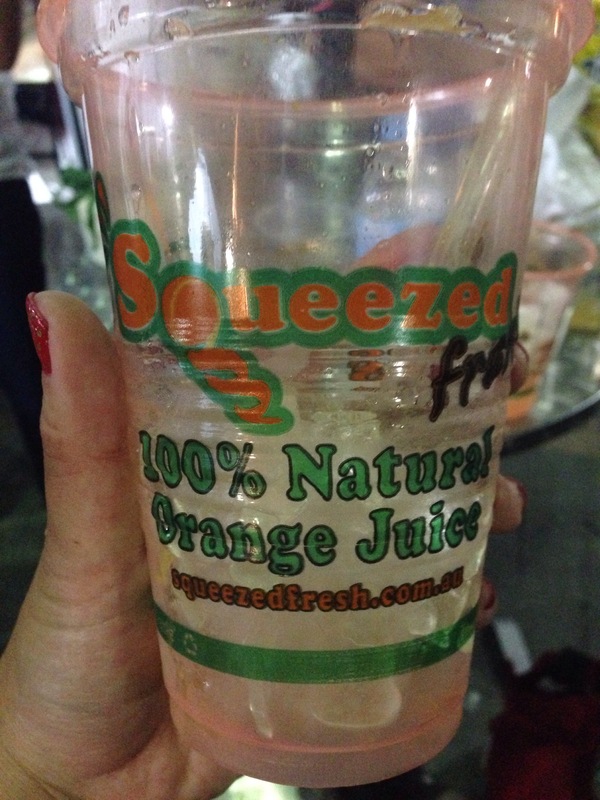 Freshly squeezed OJ ($5.00 a cup). It comes from a big orange with an annoying voice recording blasting from the side. It wasn’t in the least bit particularly sweet but I was thirsty, didn’t want soft drink and the iced tea place was too far. I wouldn’t bother getting one though. Quesadillas with beef mince I had a nibble of someone’s and I rather enjoyed it. I might even get some more today. 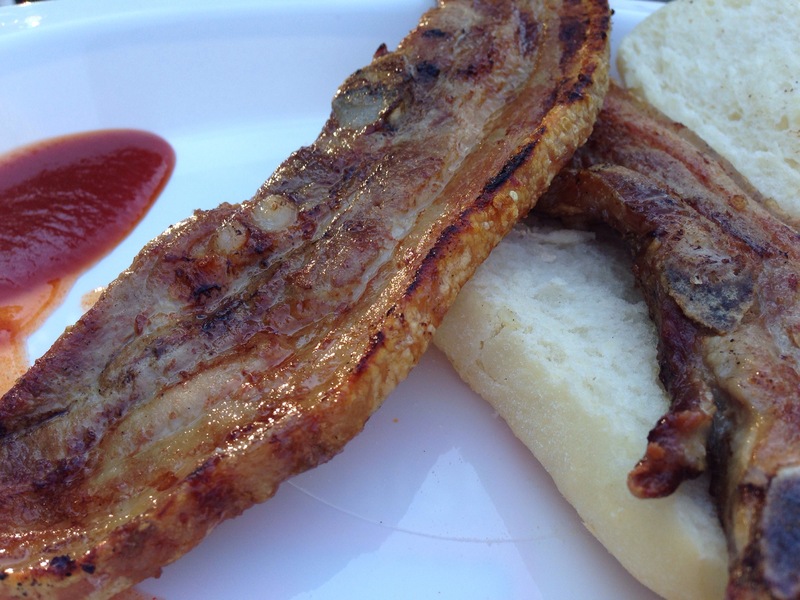 Portuguese pork belly ($8.00?). Needless to say that we tossed the bun aside as it was too thick and didn’t add anything to the meal. 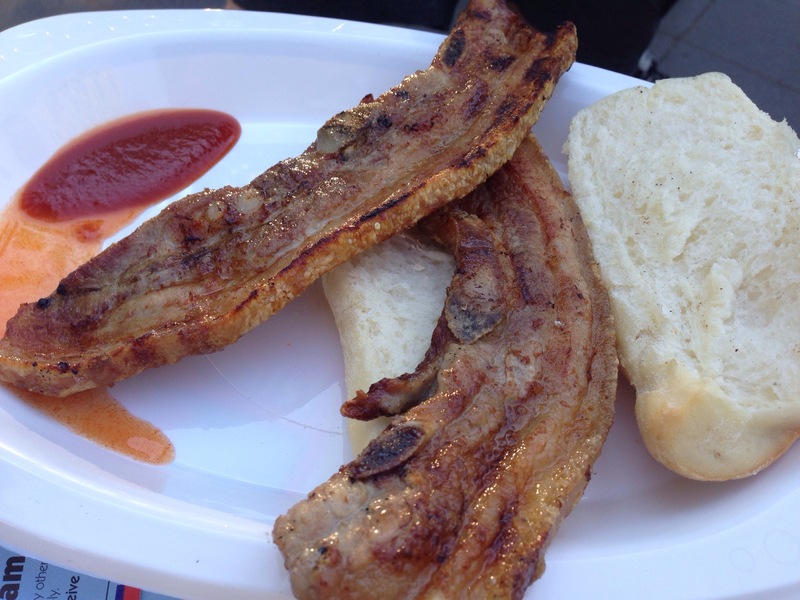 The pork belly was crispy, thin and with a good amount of fat but I didn’t think it was anything special or worth trying again. 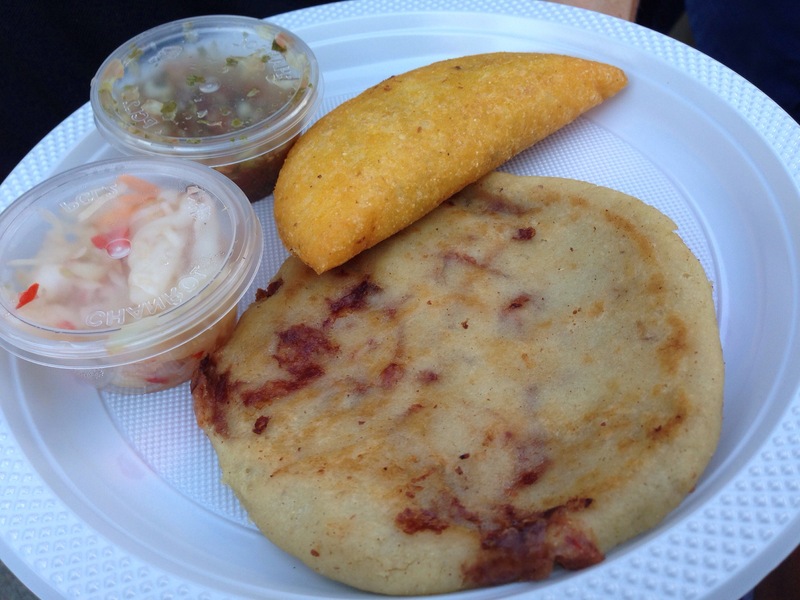 Pupusas and something delicious from the Colombian stall. This is what kind of descriptions you get when confused friends come back with a plate ‘I’m not quite sure’ type of descriptions. I enjoyed the ‘other thing’ that was a half moon shape more than the pupusa. It had a corn meal type of shell with a delicious meat filling that went really well with the nondescript condiments. 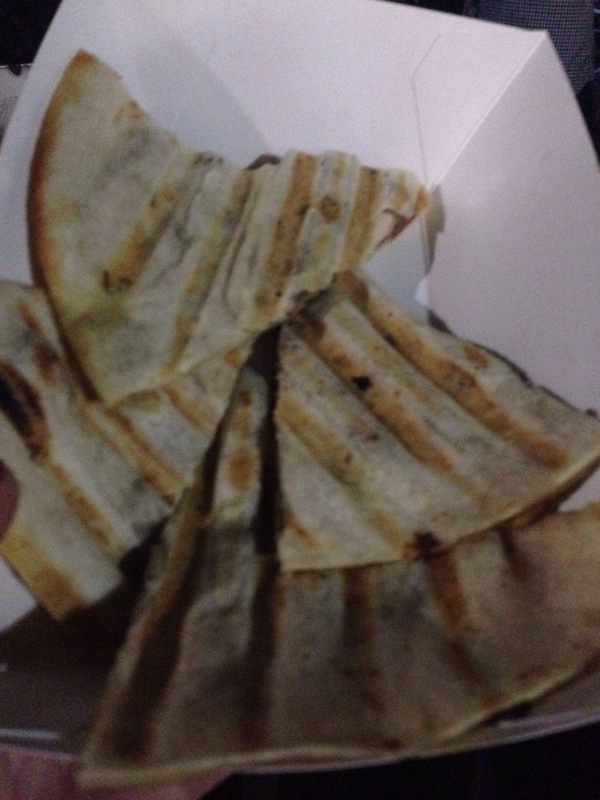 The pupusa is a flat bread with a thin layer of beans (maybe also meat?) inside. 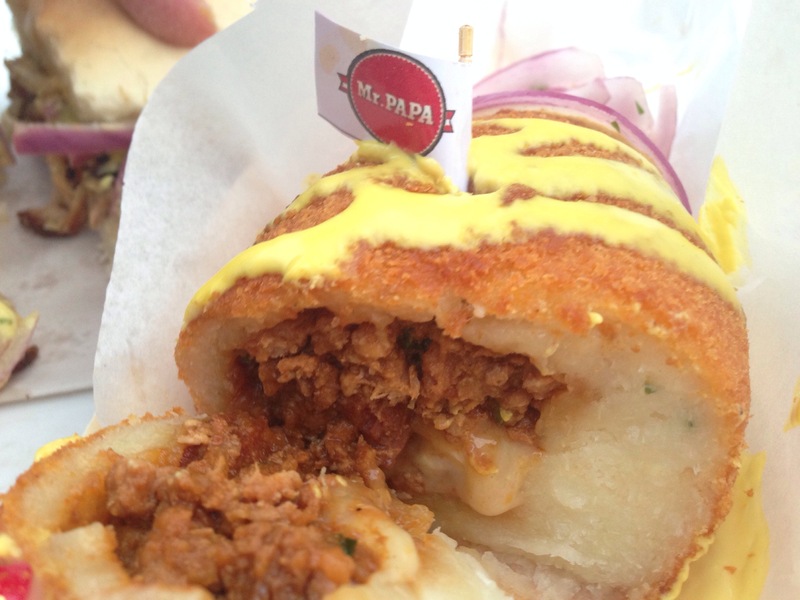 Mr. Papa Peruvian street food. I was told this is what to get from a friend (thanks Dan!). 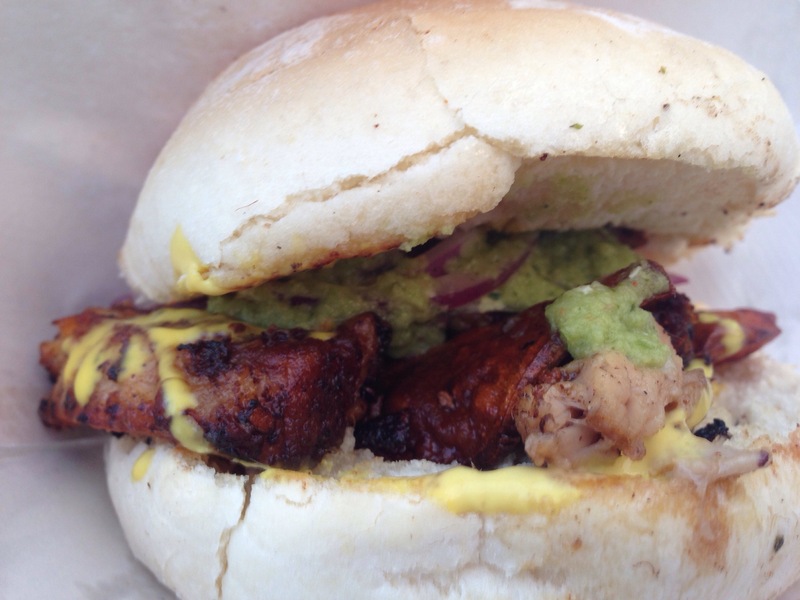 Of course I was going to come back for the fried potato croquette looking thing (papa $10.00) that I enjoyed so much last year but this year they also had a pork sandwich with sweet potato (chanchito $12.00). Both were very good and worth lining up for. This does break my ‘no huge sandwich from one place’ rule but we cut them in quarters so it wasn’t too bad. 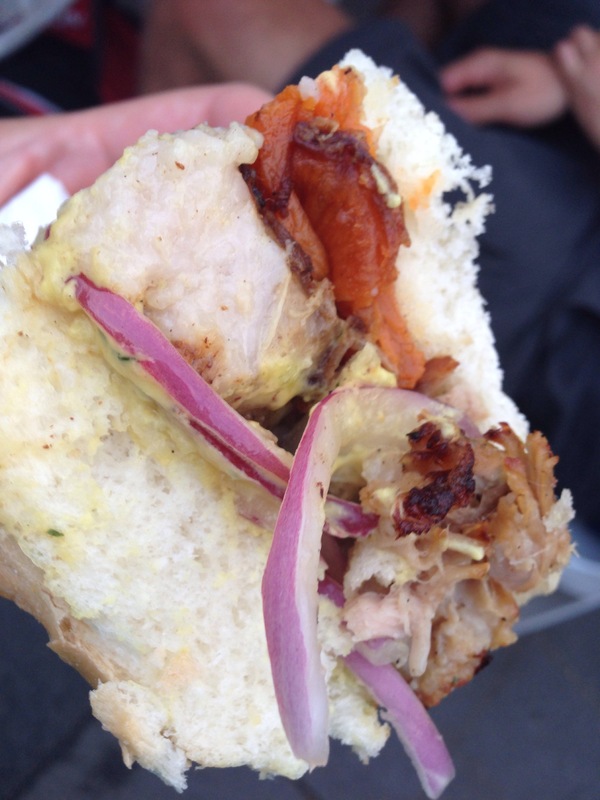 The pork was moist, nice bits of fat and crispy on the shredded outer edges, my three favourite textures of pork Mmmmm. This might be my favourite stall again second year running! Persian ice cream rosewater and saffron. I nice creamy texture with a strong rosewater taste. A nice change to the typical flavours. 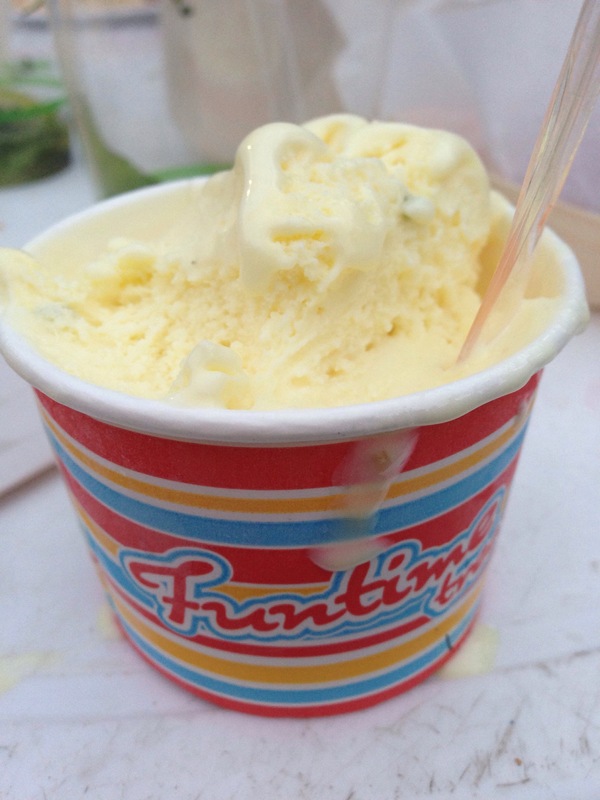 I am keen to see the other stalls that hadn’t set up last night and find if there are any Sicilian desserts this year, has anyone see them? P.S. I will also be getting my beloved Hungarian deep fried bread today.